Keeping your herd comfortable and relaxed is key to getting the most out of your investment. Rushmore Buildings provide a safer and more secure housing option than other types of structures and the outdoors. 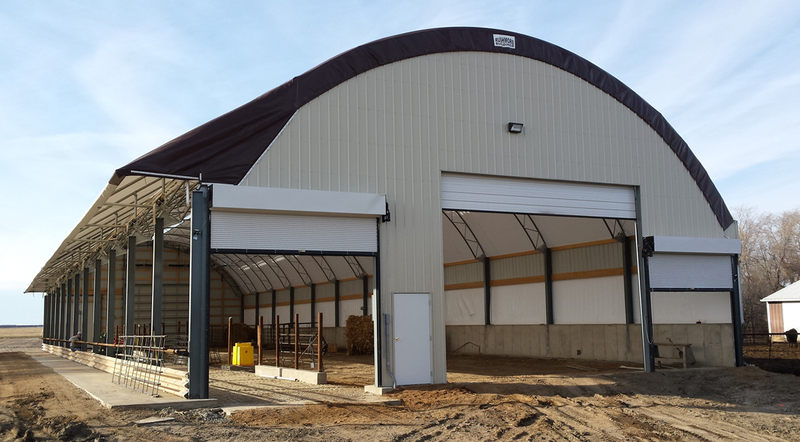 Our cost-effective buildings offer wide-open spaces and superior ventilation to give your livestock the ideal conditions for higher, faster weight gain that can translate into higher profits for you. Affordable Rushmore livestock buildings feature a woven, high-density polyethylene-coated cover which allows natural light to enter saving on electrical cost while providing shelter from the elements. The cover material we use provides UV protection and does not conduct heat or cold, allowing your building to remain 15 – 20 degrees cooler in the summer and more comfortable throughout the winter. Our quick and easy-to-set up buildings are built to stand up to the most severe weather and offer virtually unlimited configuration possibilities. With optional ridge vents, side curtains and open soffit eaves, you can control the atmosphere to create the ideal environment for optimum production. Rushmore Buildings are built to sit on the exterior walls offering an interior space that is wide-open and column-free. This allows you to set up your livestock facility in the style that works best for your operation. The open interior space gives you the option of feeding inside down a lane or adding a 5-foot eave for exterior feeding to leave more livestock area inside. Call us today at 1-866-766-5617 for your free estimate. For more information about Rush-Co call 1-866-776-5617 or send us an email.